A UCLA-led research team has created blood-forming stem cells that can carry a gene that allows the body to produce cells that can detect and destroy HIV-infected cells. The blood-forming cells, called hematopoietic stem and progenitor cells, or HSPCs, have been engineered to carry chimeric antigen receptor, or CAR, genes that allows the production of immune cells that target cells infected with HIV. After being transplanted into the body, the engineered cells formed immune cells that not only destroyed the infected cells, but also lived for more than two years. This suggests that they have the potential to give people long-term immunity from HIV, the virus that causes AIDS. Antiviral drugs are a key element in treating HIV, because they can suppress the virus in the body to nearly undetectable levels. But the virus can only be cleared from the body with an effective immune response. Although chimeric antigen receptor T cells, or CAR T cells, have emerged as a powerful immunotherapy for various forms of cancer, and show promise for treating HIV-1, the more prevalent of the two main forms of the virus, it may not impart long-lasting immunity. Researchers have been seeking a T cell–based therapy that can respond to malignant or infected cells that may reappear months or years after treatment. HIV uses a molecule called CD4 to infect cells in the body. 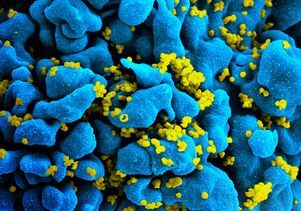 So the researchers used a CAR molecule, which contains part of the CD4 molecule, to hijack the essential interaction between HIV and CD4 to make the engineered T cells target the infected cells. When the CD4 part of the CAR molecule binds to HIV, other regions of the CAR molecule signal the cell to become activated and kill the HIV infected cell. In animal tests, the researchers found that modifying the blood-forming stem cells led to more than two years of stable production of CAR-expressing T cells without any adverse effects. In addition, the CAR-expressing T cells were widely distributed throughout the lymphoid tissues and gastrointestinal tract, two key areas where HIV replicates and persists in people who have the virus. Most important, engineered CAR T cells were effective in attacking and killing HIV-infected cells. The findings are the first to show that blood-forming stem cells can be modified with a CAR therapy that can safely engraft in the bone marrow, mature and become functional immune cells throughout the body. This could lead to the development of a treatment to ensure safe, lifelong immunity to HIV. (The researchers write that this would be most likely to work best when combined with another treatment strategy, like antiretroviral therapy.) The approach could ultimately reduce people’s dependence on antiviral medications, lower the cost of therapy and offer a way to eliminate HIV from the parts of the body where it hides. The approach also has potential for fighting other infections and malignancies. One caveat of the study is that it involves cell modification and transplantation procedures that can be difficult to perform and are only currently available at major medical or research centers. The authors are now working on techniques that would lessen the impact of blood cell transplantation and that would make the therapy more widely available and effective. Clinical trials are still a few years away. The study’s authors are Anjie Zhen, Mayra Carrillo, Cindy Youn, Brianna Lam, Nelson Chang, Heather Martin, Jonathan Rick, Jennifer Kim, Nick Neel, Valerie Rezek, Masakazu Kamata, Irvin Chen, Jerome Zack and Scott Kitchen of UCLA; Christopher Peterson and Hans-Peter Kiem of the Fred Hutchinson Cancer Research Center and the University of Washington; and Sowmya Somashekar Reddy of the Hutchinson Center. The study is published in the peer-reviewed journal PLOS Pathogens. The study was funded by an ARCHE award from the Foundation for AIDS Research (AmfAR), the California Institute for Regenerative Medicine, the National Institutes of Health, and the NIH’s National Institute of Allergy and Infectious Diseases.